Rodolfo Lanciani, Forma Urbis Romae (Rome: Edizioni Quasar, 1989). One of the four great piers holding up the dome of St. Peter's Rome is dedicated to St. Helena. Saint Peter suffers martyrdom and is buried on the Vatican hill. The presbyter Caius, as quoted in Eusebius' Ecclesiastical History (303-324), points polemically to the tropaia in Rome of Saints Peter and Paul on the Vatican and the Ostian Road respectively. Coin found inside sarcophagus in mausoleum of Trebellena Flacilla below south transcept, proves intactness of cemetery at that time. An inscription, now in the ex-Lateran Museum and possibly of fourth century date, is generally interpreted as referring to an interruption of twenty-eight years in the annual sacrifices offered to the Great Mother in the Phygianum sanctuary, presumably located near the south end of Maderno's facade of New St. Peter's and thus south of the atrium of the old church. Concomitantly a gap occurs between 319 and 350 in a series of dedicatory inscriptions referring to these sacrifices and found, though not in situ, mostly in the excavation for Maderno's facade, others in the Borgo and as far as Castel S. Angelo. Hence a date shortly before 350 is suggested as ending this interruption. The break in services has been linked to the disturbance caused by the construction of Old St. Peter's nearby, and a beginning date between 319 and 322 for work on the church has been proposed. Constantine endows S. Peter's with rich land holdings, all in the Eastern provinces, hence not in his gift before the defeat of Licinius, September 18-20, 324. 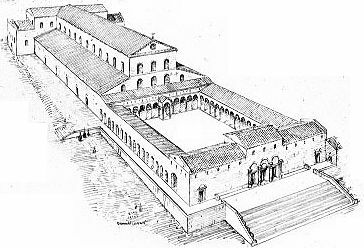 Richard Krautheimer, Corpus basilicarum Christianarum Romae: Le basiliche cristiane antichi di Roma (sec. IV-IX) (Cittá del Vaticano: Pontificio istituto di archeologia cristiana, 1937-).